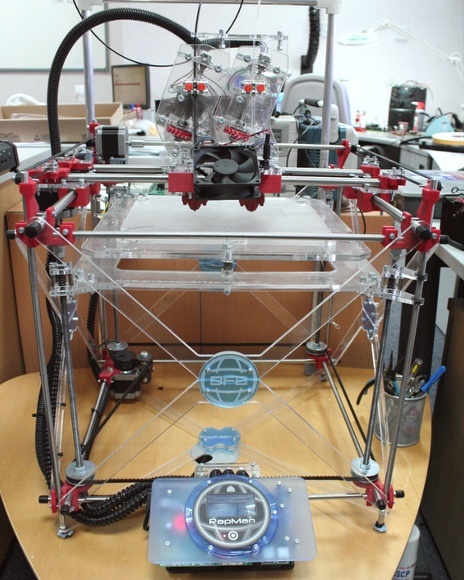 Last year, as this blog testifies, we bought and assembled a 3D printer from a kit. In doing so, we unwittingly joined a revolution. I lead part of a design department, populated by engineers. We understand technology, and the logistics and requirements of manufacturing, and we know how to communicate it. We actually own a 3D printer, with the intention of using it seriously. The printer was bought and constructed on the understanding that it would pay for itself. 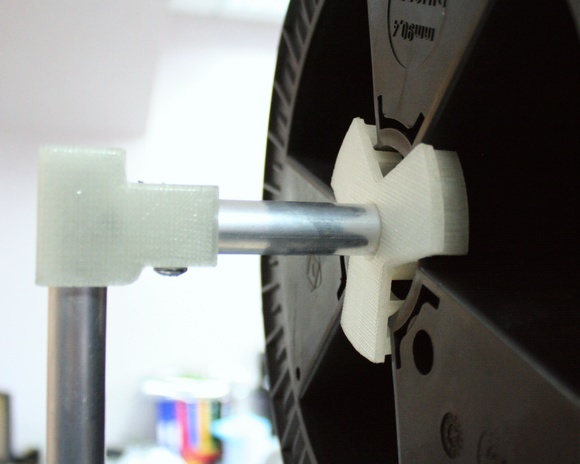 Our printer complements more established methods of rapid prototyping. We sometimes hire external companies to build rapid prototypes for us in foam, plastic or metal using a number of more mature techniques: SLA, SLS, or CNC, as cost, size, and material considerations dictate. Our printer builds up a physical object, one layer at a time, by extruding a filament through a heated tube. Each printed layer is a quarter of a millimetre thick, and cools and solidifies in time for the next layer to be added on top. This method is favoured because it is very inexpensive and requires no specialist chemicals or high-powered lasers. Prusa, the Makerbot Replicator, and the Bits from Bytes Rapman are all based on filament extrusion. The world is beginning to see its potential and its problems. One of the printer’s first jobs was to service itself. It still has a sideline in printing its own spare parts. This detail is from a spool holder I designed, which helps to feed filament reliably into the machine. The two printed parts are white. Filament extrusion seems straightforward, but is deceptively subtle, beset by the problems of a technology in its infancy. There is a choice of at least four pieces of software that can be used to convert a three-dimensional CAD model into a stack of two-dimensional lamina, and then to a set of instructions to control the printer. I know of Skeinforge, Slic3r, KISSlicer, and Axon. All have different strengths and weaknesses, can be hard to configure, and are inaccurate, unreliable and cumbersome in different ways. One has to master the peculiarities of the software, and it’s quite a skilled job. To coax the slicer into working well is a craft in itself. None of the software will work satisfactorily without a substantial amount of human intervention. The work must be oriented appropriately so that it is maximally easy to print. A material must be chosen. The correct head speed, extrusion rate, temperature, and fill density must be arrived at by a mixture of prior knowledge, intuition, and trial and error. 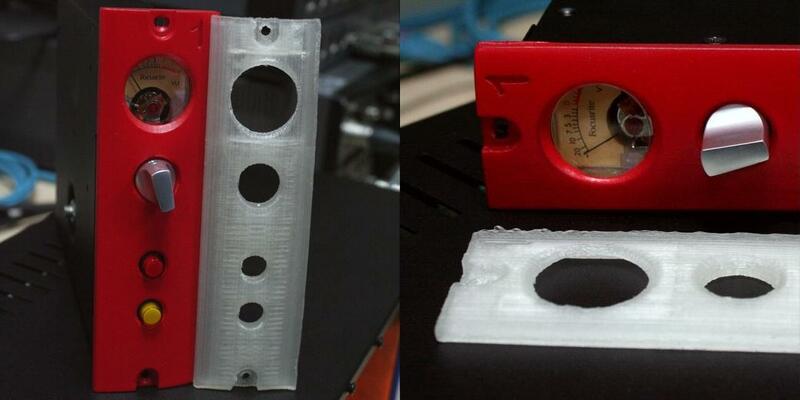 If necessary, the CAD model must be adjusted to make it easier to print. When the work is running, we must know when the printer is about to jam and what to do when it does. We must develop a sense of the correct starting height of the print bed, and adjust it manually when it is crooked, too high, or too low. We must fine-tune the print head temperature for particular layers, and turn the cooling fan on or off as the room’s ambient temperature changes to allow layers to adhere without warping. Between prints, we must keep the printer in calibration and perform running repairs every few hours, and be constantly vigilant to the vagaries of the software, the material, and the printer. Not only is the printing process challenging; it places restrictions on the object itself. One of the major drawbacks of filament extrusion is that the work is not self-supporting. In SLA and SLS prototyping, the top layer of material either floats in a bath of uncured resin or rests on a pillow of plastic dust. In filament extrusion, the head prints on top of the previous layer, or else on thin air. Holes or overhangs end up very messy unless the angle of slope is carefully designed. An unsupported hole of 15mm or less can be achieved without warping; a hole of about 30mm can be achieved with considerable mess on the upper face; any more than this and the piece becomes distorted and unusable. Our slicing software can automatically insert support material. Any excrescence can then be mounted atop its own little plastic pedestal, which is cut away manually at the end of the print. Currently, no software does this job very well: we add supporting posts to the design ourselves. Like the printing stage, it benefits from human intuition. These are all things that will improve as the technology matures, and as domestic 3D printing turns into a proper industry. The push-button panacea is perhaps five years from our grasp. Until then, printing remains an art, and early adopters like us must live with its frustrations, find our own workarounds for them, and support the development of tomorrow’s technology. What we have learned about material properties is difficult to impart engagingly, but was quite fun to glean from about sixty hours of printing. If you are about to embark on this journey yourself and are looking for hints on this site, there is not much we can offer you. There are so many user-, printer-, and material-dependent variables that proceeding by intuition is more likely to succeed than applying orthodox rules. However, some hard-and-fast rules very quickly manifest themselves: particularly regarding the strengths and weaknesses of the two plastics. PLA is strong but brittle. It can blunt glasspaper. Its low temperature means that good-looking results are easy, but it starts to deform in response to fairly gentle warming. ABS is very strong, slightly flexible, and hence preferable for parts that undergo mechanical strain. It is easier than PLA to work with glasspaper or a scalpel, but far less easy to control during printing owing to its higher glass transition temperature. It also has a tendency to shrink slightly and warp during cooling. This is not a craft for people who expect results hurriedly, or at the first attempt. There is something delightful and compelling about this kind of additive 3D printing, and there is a very strong temptation to print objects just for the sake of it. This is a very young technology, promising a future of low-cost object printing, and it is attempting to supplant established methods of rapid prototyping. However, it is still uncertain what the domestic applications might be. This is exactly where the home computer industry was in the early 1980s, before anybody had even coined the term killer app, let alone sought one. In industrial use, we are beginning see the benefit of having our own rapid prototyping machine. Once the software becomes more mature, it will be reliable and controllable enough to usurp some traditional prototyping methods in certain applications. It is already very good at allowing us to experiment with control surface layouts, to test the mechanical fit of assemblies, to catch silly mistakes, and to do everything we’d expect from an Issue 1 prototype. It even has its uses enhancing our office furniture with custom-made fittings. However, it isn’t versatile or precise enough for more advanced use. What’s the killer app for domestic printing? If the pages of Thingiverse provide any clues, 3D printing will start by putting Games Workshop out of business, and will then breed a generation of mechanical engineers who have taught themselves by designing, printing and assembling linkages and gears. That would be great: if somebody writes a program that enables us to start printing open-source Meccano, you won’t see me for months. There are a few special cases where this technology fits perfectly: items that are very hard to manufacture in any other way; low-batch manufacturing; local factories offering highly-customised variants of standard designs; medical and dental prosthetics, where every part must be custom-made. Outside such niches, though, the argument for 3D printing as a manufacturing process is less compelling. It uses more energy and more material than injection moulding, and cannot approach more established methods for precision, economy, and repeatability. The other problem is even more obvious. Say I’ve downloaded and built an enclosure; it’s probably taken me eight hours to get a good printout of this specialised container. Now, what am I going to put inside it? For example, one cannot print circuit boards on a domestic printer, or white goods, or furniture, or cooking vessels. The material possibilities are, and will remain, very limited. It is not my intention to finish this article by rubbishing this technology, but the hype that surrounds it is currently greater than it deserves, and this is worthy of recognition. I’d like to conclude with an idea that I’ve ventured in private, and would like to test here. The ‘making revolution’ has garnered so much attention because it is just one small part of a wider revolution. We human beings have an atavistic yearning to sculpt and control our environment. Our survival once depended upon our individual ability to grow food, to build shelter, and to construct and use tools. When these needs are met by mass-produced commodities, the link between us and the people that conceive and build our things cannot stretch across the geographies that divide us. It is not a connection that we can comfortably maintain, but it is not one we can bear to lose either. We are not automata and, although business is global, we are not global individuals. We still live and die much as we did a million years ago: in little social groups, with our own interests, beliefs, and desires. The response to divesting control, and losing our parochial craft and culture (of which design is just one facet) to greater economies of scale, is to make anew. The objects that we make must suit our requirements; they must reflect our passions and prejudices; they must be just right for us. A 3D printer, or a soldering iron, allows us to be expressive in a manner that is more familiar to many of us than brick, paint or clay. The maker and hacker movements are exemplified just as clearly by stencil graffiti and urban allotments as they are by our RepRap printer. So, perhaps the more faceless and undistinguishble our environment becomes from all the others, the deeper our need to imprint it with something of our own. Something that is uniquely inspired, uniquely enriching, and uniquely ours.